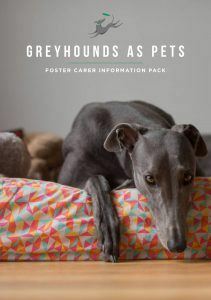 If you would like to help re-home retired greyhounds, but aren’t in a position to adopt a greyhound of your own or aren’t sure if they’re the right breed for you – becoming a Foster Carer is a great option. It provides you with the opportunity to experience greyhound ownership and it also helps Greyhounds as Pets WA (GAP) to rehome more greyhounds – as during their foster care the greyhounds are exposed to life as a pet, meaning that when it does comes time for them to go to their forever home they are able to adapt more easily. Foster Carers play a vital role in helping our greyhound’s transition to life as a pet. For more information on becoming a Foster Carer with GAP read our Foster Carer Manual. Does it cost anything to be a foster carer? It costs nothing to be a Foster Carer. GAP provides everything you need to support a greyhound for a 4 – 6 week period including, dry dog food and bedding for the greyhound, collar, lead, muzzle and an Adoption Pack. In addition, GAP provide foster carers with ongoing support via phone, email and face to face catch ups. All foster carers are also invited to join our online forum to network with other foster carers on our closed Facebook group. What does GAP expect of its foster carers? Love and Patience – To put up with the occasional soiling accident, the initial sleepless nights and the little mistakes the dogs make while they “learn the ropes”! Socialization – GAP asks that all foster dogs receive socialisation with other dogs in foster care. PUPi training is provided free of charge for all foster carers and provides opportunities for all dogs to receive socialisation. If you are unable to provide socialisation for your foster dog, GAP can easily arrange moving them to a new foster home where they can receive additional socialisation. Flexibility – GAP asks foster carers to be flexible and we do our best to return the favour. This means we may ask you to take the dog somewhere or switch dogs at short notice. We know life sometimes gets in the way of a good plan, and we do our best to work with every foster family to get the best outcome for the dogs. Vet Care – GAP has a network of vet clinics that allow us to provide greyhounds to people at the lowest possible cost. Therefore we ask foster carers to take dogs to our preferred clinics if the dog requires veterinary attention. GAP covers the cost of sterilization and dental work for the greyhound while they are in foster care. Exhibitions and Adoption Days – GAP often attends large scale exhibits such as the Perth Royal Show to educate the public on the gentle nature of our breed and to encourage people to consider fostering or adopting a greyhound. We often ask our foster carers to attend these events. The GAP program has grown rapidly over the last few years and we now try to organise mass adoption days were a number of foster families and dogs, plus prospective forever families are invited to come along to a designated venue for a meet and greet. Feedback – This is the most important aspect of fostering as it is your information that allows us to place the greyhounds in the most suitable homes. We ask that you provide us updates on the dog’s behaviour such as what type of home it will be suitable for and what type of experiences it may still need to be exposed to before being ready for a forever home.